Prickly pear cacti are economically important to Texas and Mexico. They’re also the larval food of the cactus moth, a nonnative species that’s heading to Texas. Invertebrate biologist Michael Warriner says the larvae of this prolific South American moth species, which is active this time of year, can decimate prickly pear populations. 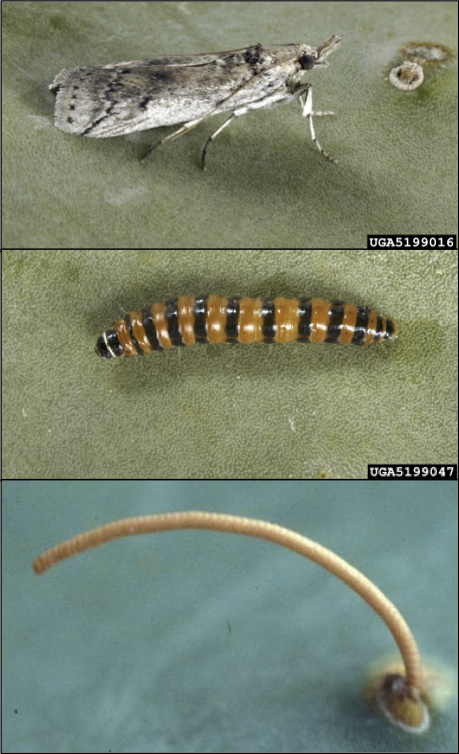 The adult insect is non-descript and difficult to identify, but the larvae is easier to recognize. Looking for the larvae or evidence of feeding damage is the best thing to look for. The caterpillars themselves are a bright orange to red coloration with black bands or spots. The larvae spend most of their time inside of the prickly pear pad, and they basically hollow it out. So the pad, as the larvae feed on it, will become transparent and they’ll eventually just collapse. You can still control it by removing the infested pads and that would help. Disposing and burning them. Or simply enclosing them in some kind of plastic bag to heat up the larvae and kill them. Find links to more information about the cactus moth at passporttotexas.org. Map from presentation by Kristen Sauby, from her presentation to the Ecological Society of America Annual Meeting. There’s a moth making its way to Texas from Florida whose larvae feed exclusively on prickly pear cactus. The cactus moth has proven to be a really effective eradicator of prickly pear. Invertebrate biologist, Michael Warriner, says Australian officials imported the cactus moth—a South American native—in the mid-1920s as a biological control against the coastal prickly pear; a nonnative species they had imported in the early 1800s. And over a few years, it didn’t totally eliminate it, but it reduced it substantially. So, it’s proven to be one of the most successful biological control agents, as far as insects go. 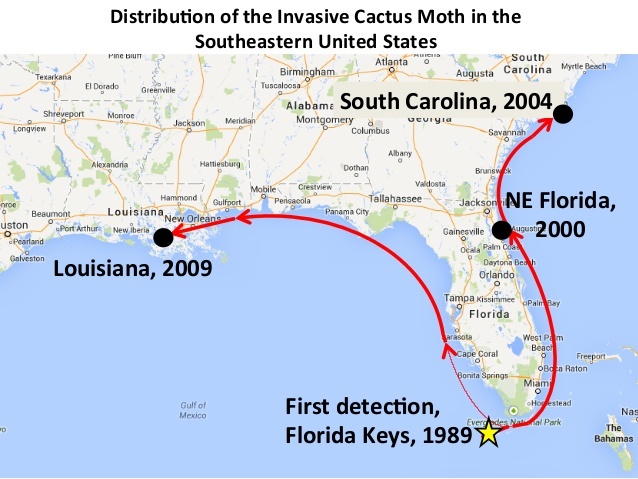 The moth, discovered in the Florida Keys in 1989, may have arrived on imported prickly pears, and since then has spread up to South Carolina and over to Louisiana. So, the concern is that if it makes it to the southwestern United States and Mexico that it could have a similar impact and eradicate or reduce prickly pear; and the fact is that—for Mexico especially—prickly pear is a major agricultural commodity in the tens of millions of dollars in terms of value. And it’s worth millions of dollars in the US, too: for agriculture and biodiversity and landscaping. Tomorrow: How to identify and prevent the spread of the cactus moth. You are currently browsing the archives for the cactus moth category.